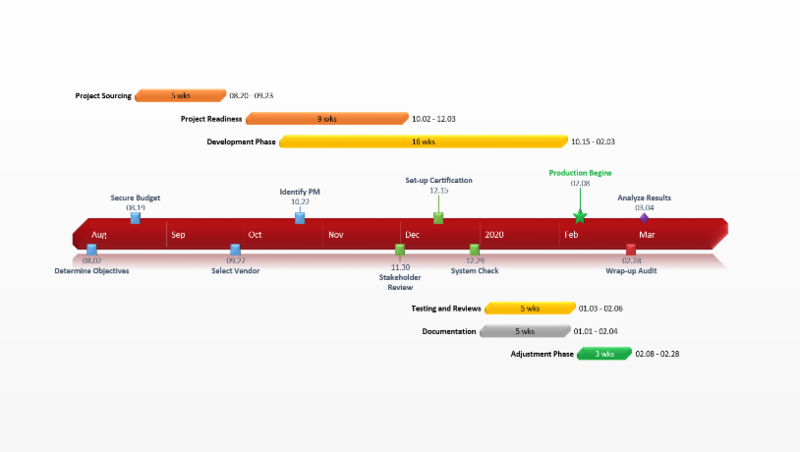 The free project template was created to show projects milestones to important clients and executives. The template is an easy way to visually plan a project or to create a project timeline for proposals, campaigns, status reports and reviews. A good project communication plan is critical in successfully delivering any project. 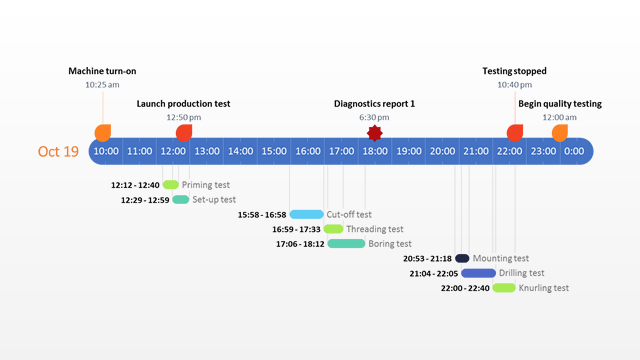 Communicating with team members and stakeholders in a clear way, while using a familiar tool, helps align all the participants around clear expectations. The template was created in PowerPoint which is a familiar tool for all audiences. The template is a native PowerPoint slide so it can be edited by anyone else collaborating on the project with you. 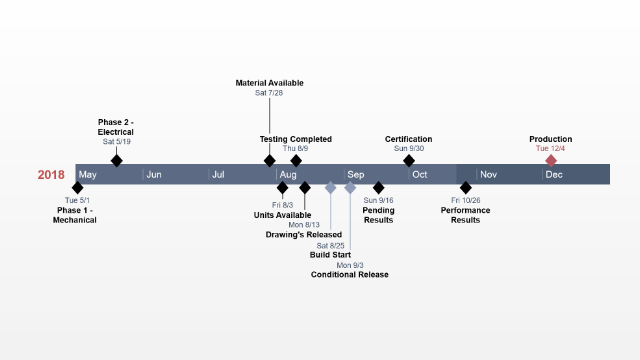 The project template will help define the major milestones of your project and their due dates. 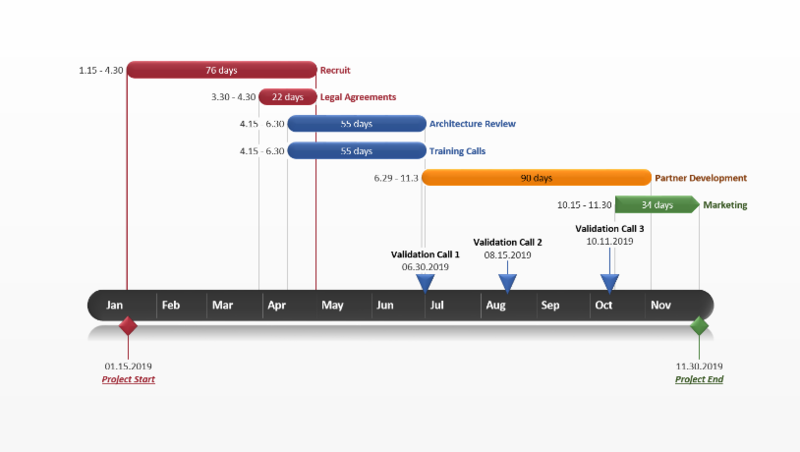 Unlike the complex timelines that project management tools make, this project template was designed to be simple and professional, so it can be presented to stakeholders who only need a snapshot of your project rather than a detailed illustration. The project template is easy to read and understand. This makes it an effective communication tool for any non-project audiences, such as clients and executives. There are two ways to update this template with your own project or plan. You can manually edit it in PowerPoint replacing the placeholders with your project milestones and adjusting the colors and positions of the objects. Or, you can automatically update it using a free PowerPoint timeline maker from Office Timeline. 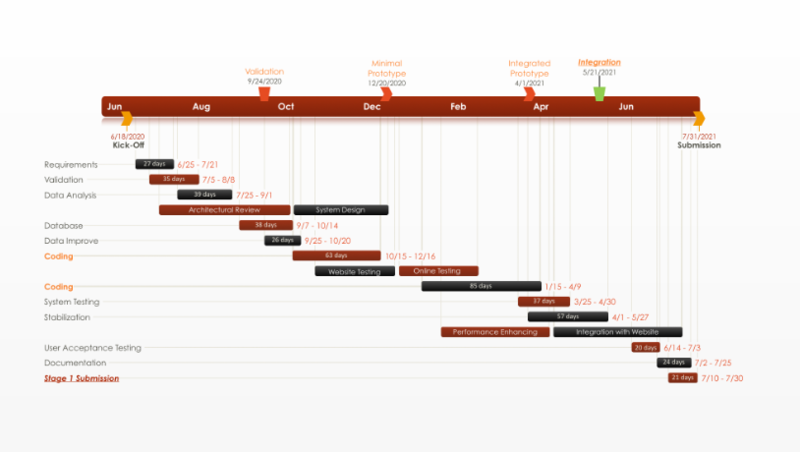 Office Timeline is built right into PowerPoint and it can update the template in a few clicks. If any dates or milestones change, the Office Timeline add-in will automatically adjust them and reposition the updated milestones on the timeline. If you need to show a bit more detail, the timeline maker can add tasks to the project template and show the duration for each one of them.